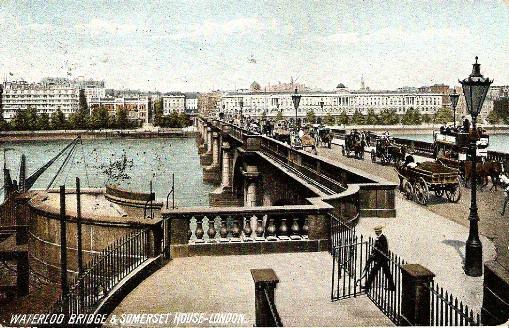 The bridge shown here was opened as a toll bridge in 1817. The toll was removed in 1878 when the bridge was taken over by the Metropolitan Board of Works. The 9-arch, 120 foot wide bridge had Grecian-Doric columns. It was taken down and replaced by 1945. Somerset House dates from 1776-1796 with Victorian extensions. It replaced a building of the same name built in the 16th century. It has housed a variety of Government offices over the years. The Embankment is a Victorian construction built to reclaim and solidify marshy land alongside the Thames in central London. It has different names along its course. 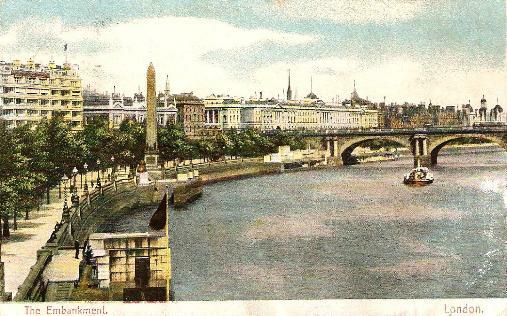 The portion shown is the Victoria Embankment, begun in 1862. Cleopatra's Needle - an Egyptian Obelisk that has nothing to do with Cleopatra - stands on the Embankment. It was actually constructed for Pharaoh Thotmes III in 1460 BC and brought to Britain from Alexandria in 1877-1878.